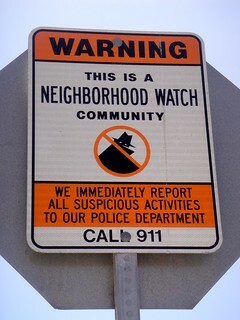 While local crime-watch groups exist to make neighborhoods safer, volunteer George Zimmerman’s harassment and subsequent shooting of the teenager demonstrate that such organizations may also be attractive to overzealous, vigilante types who may abuse their position. Criminal background checks. Chin insists that criminal background checks should be required for all neighborhood watch members – or at least those who go out on patrol. A criminal background check on Zimmerman, for example might have turned up his violent past and flagged him as an unsuitable member for the local neighborhood watch. In 2005, he was charged with resisting arrest with violence and battery of a law enforcement officer; the same year, his ex-fiancé was also granted a domestic violence restraining order against him. Anti-weapon policies. In addition to criminal background checks, another safety measure Chin recommended was that crime-watch groups create written policies prohibiting members from carrying weapons while carrying out group activities, regardless of whether they have a license to carry. Extra training. Finally, he suggested that neighborhood watch organizations consider providing extra training to make sure members understand the laws around using deadly force.